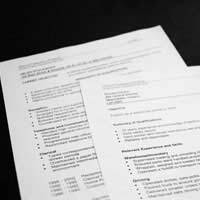 Every résumé or curriculum vitae (CV) is unique, as it is a reflection of one individual's personal experiences and accomplishments. Therefore, each CV incorporates a variety of details and facts into a few pages. Here, we'll explore some of the most common elements that most CVs contain. It seems that it should go without saying, but people honestly can forget to put enough contact information in their CVs. Make sure your CV contains everything a prospective employer, client, or other person will need to get in touch with you, including your name, address, phone numbers, facsimile number, email address, and, if applicable, website. Most CVs contain employment information, such as where you worked, the location(s) you worked, what your position title was, and what your duties and responsibilities were. Some CVs also include the years that you worked at the businesses; however, there has been recent buzz as to whether including date information is truly relevant. In the end, it's up to you to decide how critical those details are. Additionally, some people choose to only list their last four or five positions held rather than their entire employment history, especially if they have worked in a number of different places. Depending upon what stage of your career you're in, your educational background will look very different. If you're trying for your first job, you might want to include your secondary school name and locale; conversely, if you've been in the workforce for many years, that information is probably not suitable. Make sure you include any trainings or certifications you have attended or completed throughout your life; often, this will grab the attention of whomever is reading your CV. Many CVs begin with a statement of purpose, which is akin to a personal mission statement. For instance, a marketing and sales professional's might read: "Twenty-year marketing professional seeks a position with an established accounting, investment, or engineering firm where he can use his knowledge and creativity to boost sales and increase public relations." If you're having difficulty writing your statement of purpose, remember that it should be truthful and attention-grabbing; however, it shouldn't seem too boastful or lengthy - one (or two) sentences is plenty. The summary of qualifications is typically a bullet-point listing of the CV writer's achievements. Usually, there are only a few of these; thus, it's important to choose which to include very judiciously. Make sure you address only your measurable qualifications, such as: "Decreased expenses at ABC Company by 48% over an 18-month period" rather than "Decreased expenses at previous employer." That way, the busy person who receives your CV can rapidly scan it and know some specific facts about your achievements in just a few moments. Though it's not needed or expected, some have theorised that adding a dash of personal information (i.e., birthdate, hometown, names of family members, hobbies/interests) makes a CV appear to be more "real" and less standardised. Though adding personal data may indeed make a CV stand out, it doesn't always do so in a positive vein. If you're unsure as to whether your personal information will be met with smiles or scowls, play it safe and leave it out. Of course, there are plenty of other elements you can add to your CV. For instance, if you're a doctor, you may want to include all your medical appointments, speeches at annual conventions, published papers, and the like. Similarly, an actor would include his or her recent theatrical assignments as well as a photo (known in the industry as a "headshot"). Finally, you may even be asked to include other data about yourself and your successes depending on who is requesting your CV. In the end, just remember to always be factual, try to make your CV succinct, and, above all else, allow yourself to be a little impressed by your own achievements. After all, they represent a great deal of time, effort, and enthusiasm. Do Employers Care About My Interests on a CV?